Value of diverted forestland not recovered completely. Where is the money? 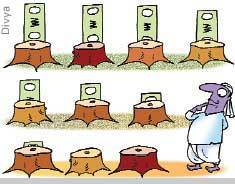 In 2002, the Supreme Court ordered state governments to collect money for projects that felled forests. The money, called the net present value (npv), was to be collected for diversion of forestland for non-forest uses and deposited with campa (Compensatory Afforestation Management and Planning Authority). But the Union environment ministry has no record of how much money is due from states. A conservative calculation by Down To Earth (dte) found a gap of at least Rs 11,000 crore between the amount collected as npv since 2003 and the minimum npv for forestland diverted.From an internal document of the ministry, dte calculated the economic value of forestland diverted since 2003 and compared it with the money in campa fund (see box). In 2002, the court had ordered that depending on the quality and density of land, states collect npv ranging from Rs 5.80 lakh per hectare to Rs 9.20 lakh per hectare. It revised this figure to Rs 4.38 lakh per hectare to Rs 10.43 lakh per hectare in 2008. States were to collect npv, along with funds for compensatory afforestation and catchment area treatment, before according approval to any project under the Forest Conservation Act, said lawyer-activist Ritwick Dutta. That was October 29, 2002. The authority to manage the funds collected, Compensatory Afforestation Fund Management and Planning Authority, or campa, was formed four years later, he added. The environment ministry has no data of how much money states invested in compensatory afforestation between October 2002 and May 2006. Meanwhile, the apex court ordered exemptions, which may have led to the gap, said Kanchi Kohli of the non-profit Kalpavriksha in Delhi. The court, in September 2005, granted npv exemptions to certain projects such as government hospitals, dispensaries, schools, rainwater harvesting tanks and other such non-commercial ventures. Though the court pointed that only non-commercial and non-revenue-earning government public welfare projects could be granted exemption from npv, it later allowed a series of general and specific exemptions for commercial activities, said Kohli. For example, the supreme court granted 50 per cent npv exemption for underground mining and domestic wind turbine makers and complete exemptions to defence projects such as roads. A senior official of the environment ministry acknowledged that npv had either not been recovered by state governments or was exempted under the Forest Conservation Act. The gap highlights the lack of concern by state governments in recovering npv from the companies for forest conservation and full or partial exemptions made for variety of project categories and specific projects, Dutta added. Supreme Court lawyer Raj Panjwani said since most private projects were executed in partnership with state government, as part of a memorandum of understanding, the npv money was routed through state corporations. States are reluctant to transfer money from their accounts to the Centre. npv is a classic case of strained Centre-state relations, Panjwani said (see Why states are against campa? Down To Earth, January 15, 2006). Though the law mandates supervision of the land diversion records by environment ministry, state governments do not submit the quarterly project reports on time and get away with the carelessness easily, the ministry official said. The ministry sends out letters to the defaulting states, which have not submitted quarterly progress reports, but there has been no regular data management by the states on npv funds, he added. The internal document also revealed that between 1980 and 2009, about 19,000 projects were cleared and 12,000 sq km of forests diverted. While diversions amounted to more than 600 sq km of forests per year, its equivalent afforestation measures covered only half the area lost. Of the 19,000 projects, states monitored 746. Of that, 404 violated the forest conservation act, non-payment of npv for example.